Shooter fans who missed out on the fun the first time around will soon be able to check out the full suite of Borderlands games in the latest Borderlands The Handsome Collection for PlayStation 4, Xbox One, and PC. 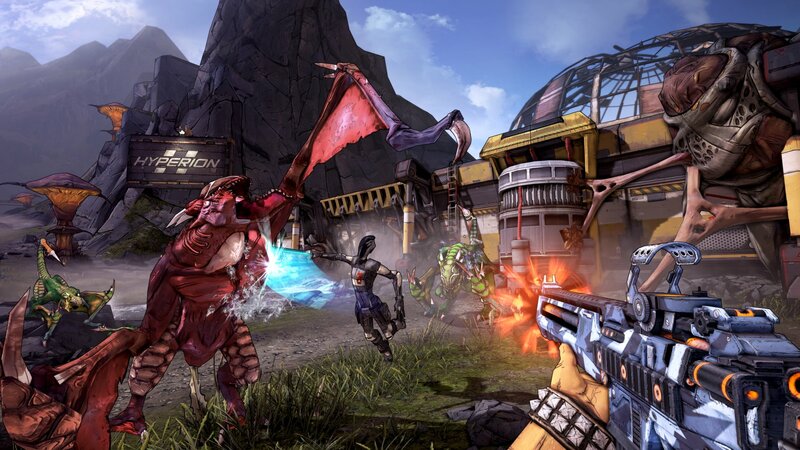 Revealed in the recent Gearbox PAX East 2019 presentation, the new Borderlands GOTY-esque collection includes Borderlands 2 and Borderlands: The Pre-Sequel, both featuring PS4 Pro Enhanced and Xbox One Enhanced visuals, notably including 4K Ultra HD and High Dynamic Range support. In addition to landing on both the Sony PlayStation 4 and the Microsoft Xbox One, the newer edition of The Handsome Collection — not the previous release Xbox and PS4 release from 2015, but the newly-announced one from 2019 — will also be making its way to Windows PCs via Steam. While it doesn't appear to be listed on the Steam storefront yet, it won't be the listing for the old Borderlands: The Handsome Collection on Steam, which is currently on sale for $14.81, a savings of 94 percent over the base bundle cost. Like with the newly revealed 2019 Borderlands: Game of the Year Edition, the games featured in the Borderlands: The Handsome Collection 2019 will feature general gameplay and quality-of-life improvements made to the games after their original releases. Beyond 4K visuals and the Ultra HD Texture Pack for PC players, the games also include all DLC and the ability to transfer save files between previous-generation to current-generation consoles. Borderlands: The Handsome Collection 2019 will release for PlayStation 4, Xbox One, and Windows PCs via Steam on April 3. For more PAX East 2019 coverage including fresh game reveals and late-breaking news, be sure to keep it tuned right here to Shacknews. Kevin the way I understood it was Borderlands 1 was a separate remaster from the Handsome Collection remaster which is BL2 and BL Pre Sequel with all DLC. I don't see any mention of BL1 in the trailer. Yup, BL1 remaster is sold separately. yep but Kevin's article implies it is included in The Handsome Collection, it is not. Here is the video for the BL1 remaster. Thanks guys. Wires certainly got crossed, what with the magic shows and Gearbox's odd desire to reuse naming conventions from past releases. The story has been updated to reflect that the new Handsome Collection only features Borderlands 2 and Borderlands: The Pre-Sequel. Thanks for the help! Yep np, BL1 remaster looks free on Steam but possibly $30 on PS4, and XBOX1. Can't confirm. So if I get Old Borderlands Goty, I will get a Nu Borderlands Goty for free. Is this the same for Old Handsome Collection? If on PC Steam you get BL1 and Handsome Collection remasters for free on April 3 if you already own them. If on console you get Handsome remaster free but BL1 remaster is $30. If you own Handsome on console that is! This is confusing, people are posting conflicting takes on this: to get the "UHD" patch on PC, you must have the Handsome Collection on Steam or just having the base BL2/Pre-sequel games suffice?